Yes we can. You will hear that expression of confidence throughout the Radiant Global Logistics system every day. For over twenty years Radiant Global Logistics has been a proven leader in the efficient and timely movement of both domestic and international cargo. With a network of Radiant Global Logistics service centers and agents worldwide our answer is "Yes. Yes we can". Radiant Global Logistics provides a wide range of time definite services throughout the United States, Canada and Mexico. As a premier provider of air, land (surface) and rail service, Radiant Global Logistics is uniquely qualified to deliver the highest quality of service while maximizing every transportation dollar invested. Radiant Global Logistics is a global leader in the movement and management of shipments worldwide. Having developed an extensive and well qualified network of international agents and logistics professionals, Radiant Global Logistics is prepared to provide air and ocean consolidation, freight forwarding, pick up and delivery and customs brokerage service across the globe. Logistics and supply chain management today requires a wide range of capabilities, abilities and disciplines. Radiant Global Logistics has an exceptional menu of services and has assembled a skilled and experienced team to meet every challenge. 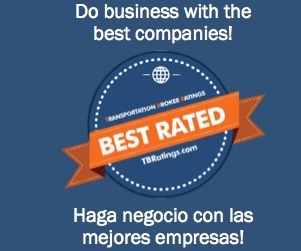 Radiant Global Logistics has been a has been rated as “BEST RATED” company since 2011. It has been a pleasure to work with Radiant Global Logistics at their Laredo Branch. They always pay promptly. Their staff is friendly and professional.